As the weeks grow closer and closer, and my husband and I start thinking about preparing our hospital bags, I have been overwhelmed with all of the cute matching sets that are coming at me from every angle on Pinterest and Instagram! The mama in me wanted to order them all, but the sewist in me knew that I would cherish them so much more if I made them myself… So earlier this month, exactly 2 months from our little girl’s due date, I whipped up our first matching set – a comfortable knit robe for me to wear in the hospital, and a matching sleeper gown for baby! All topped with a big pink bow. panda bear for scale, until baby arrives! For this set, I used a combination of indie patterns from designers that were all new to me. 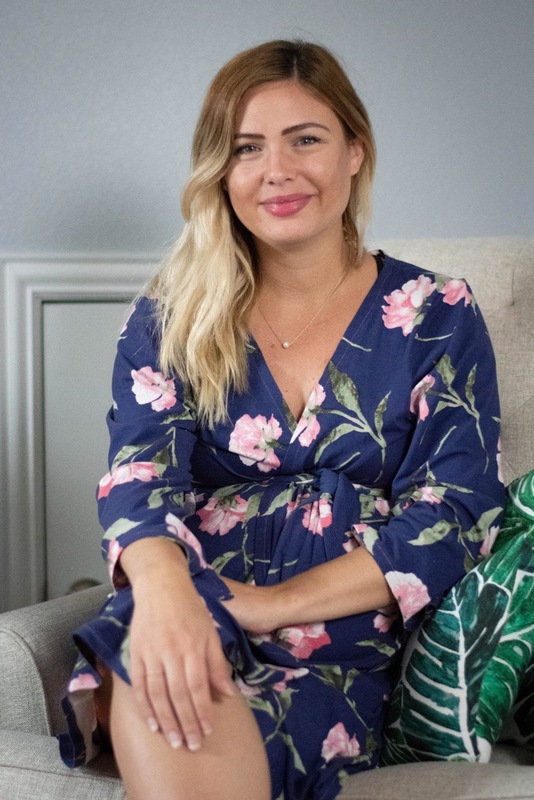 I discovered these patterns and designers while hunting through Etsy for great baby patterns, and within a facebook group for maternity sewing. 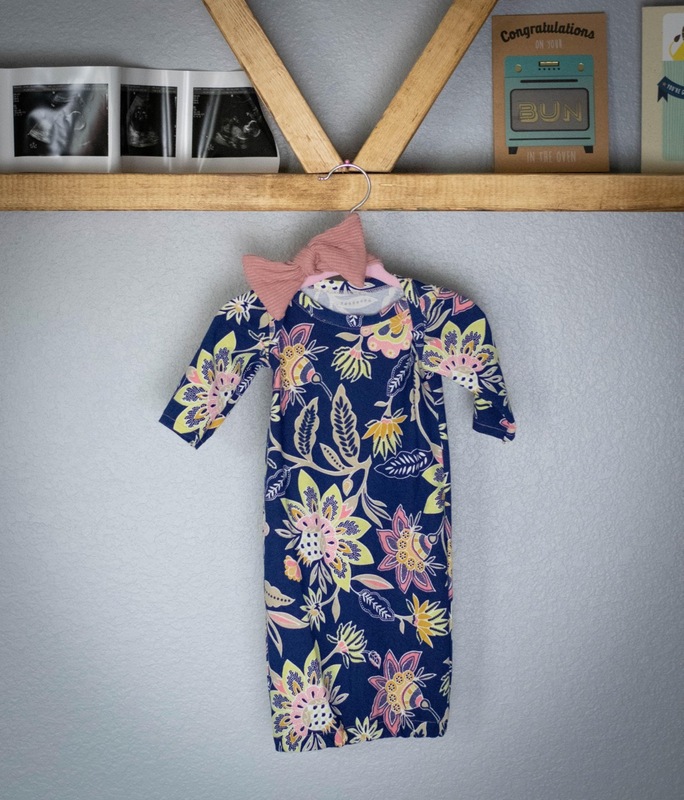 The sleeper gown is by See Kate Sew – it is a straightforward, elastic-bottomed sleeper that is perfect for tiny ones! 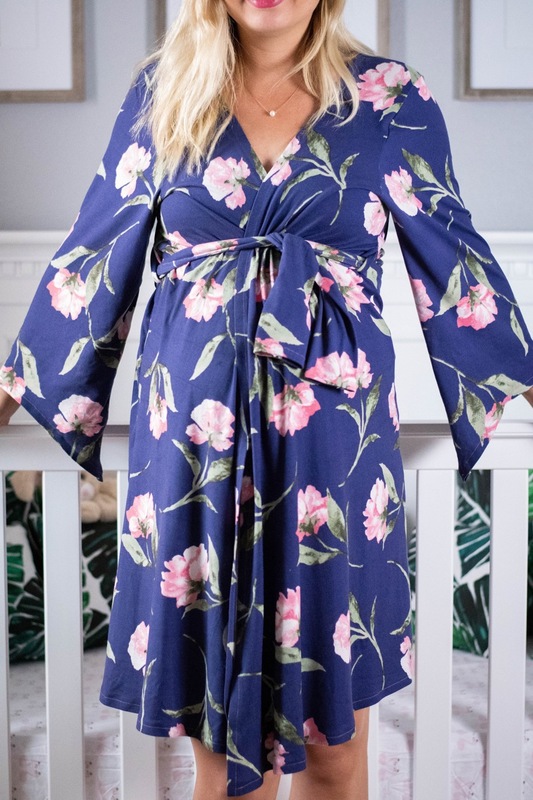 The pattern also comes with a mermaid tail option which ties below baby’s feet, and I’m sure you’ll be seeing this version in my makes after a while! I sewed this one up in the newborn size, as I specifically want it for the hospital and coming home. 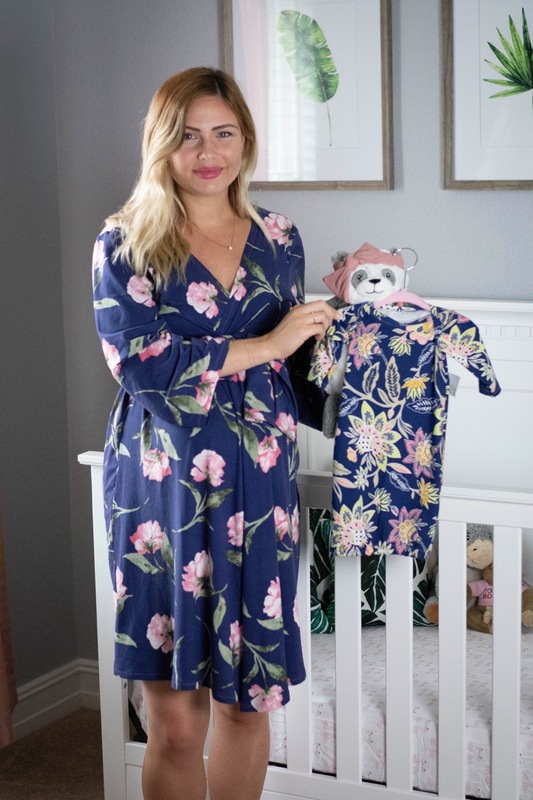 I don’t plan to sew many things in newborn size, simply because I would hope for more than one wear, so I plan to primarily opt for 0-3 months as my smallest size. This will be the exception! The bow pattern is by Olive U Sew, and came in a pack of two bow patterns which range from newborn to adult size! I don’t know if I’ll be able to pull the giant bow look off as cute as my little one will, but I might just have to try one day. My portion of our matching set is a FREE pattern from Rad Patterns! 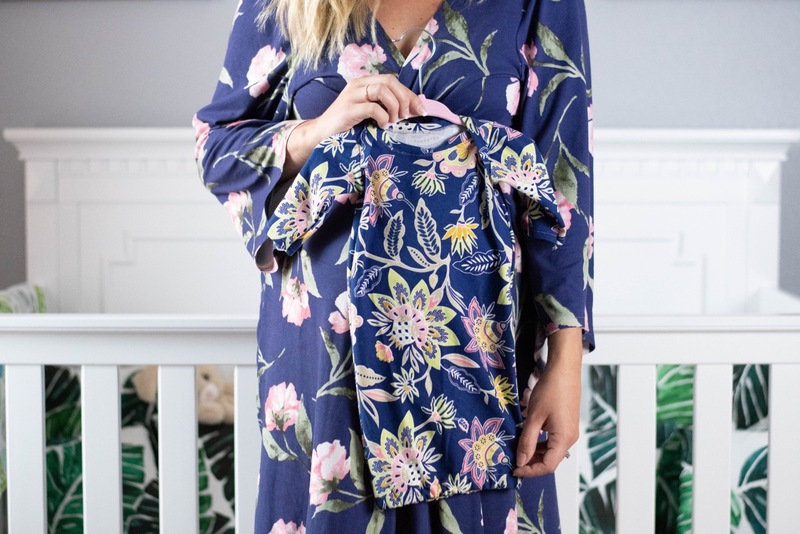 This is called the Grab & Go Robe, and the pattern is super versatile – it can be made from wovens or knits; it can be a casual layering piece in the shorter length, or a full robe in the longer length; it has a plain or pointed sleeve option, and even an optional neckband. I wanted a hospital robe that would be cute enough to have on in photos, but also functional for skin-to-skin, so I started picking my pattern options to match this vision. First of all, I chose this great double brushed poly from So Sew English fabrics. I ordered this fabric without any particular pattern in mind, and as I began to think about hospital sets, this seemed perfect. The Girl Charlee fabric that I used for baby’s sleeper gown had come to me as a scrap piece thrown in with another fabric order over a year ago. I had always had a hard time figuring out what I might do with it, because the amount of fabric was definitely usable, but much too small to make anything for myself. When I was looking around the sewing room one day, I realized how great these two fabrics looked together, and decided that a matching set was meant to be! I always intended for this to be a full robe, wearable alone or over something like a nightgown while in the hospital, so I opted for the longer length of the two pattern options. However, I had read a few reviews noting that even the longer length was running a little bit risqué on some other sewists. At 5’8”, I decided to avoid any wardrobe malfunctions and I added a full 5 inches to my length, and I think it turned out perfectly. I didn’t decide to add the optional neckband in, and I really like the way the neckline turned out without it. However, if you are looking for more coverage, I think the neckband would help that situation! Lastly, I went with the pointed sleeves – I liked the little bit of extra they added to the design, and also knew that if they end up getting in the way, I could always cut them back and do a straight hemmed sleeve! Aside from adding length, I also added belt loops and a hanger loop to the pattern. The belt dimensions were included in the pattern, but the instructions suggested simply stitching the center back of the belt to the center back of the robe. I prefer the belt loops route, so I simply dug through my patterns and pulled out the loop piece from my Suki Kimono pattern! I used this to create the three loops, then simply sewed the belt loops in between the front and back pieces after measuring where I wanted them to fall on my body! The hanging loop was pinned in place as I folded down my neckline, and sewn into this hem. I finished the neckline, sleeve, and bottom hems all with heat n’ bond. Of course. This is a GREAT pattern, especially given that it was so generously offered for free to members of the Rad Patterns facebook group! I’m super excited about my hospital gown, and a little emotional over the fact that I officially have made my first mama daughter set. 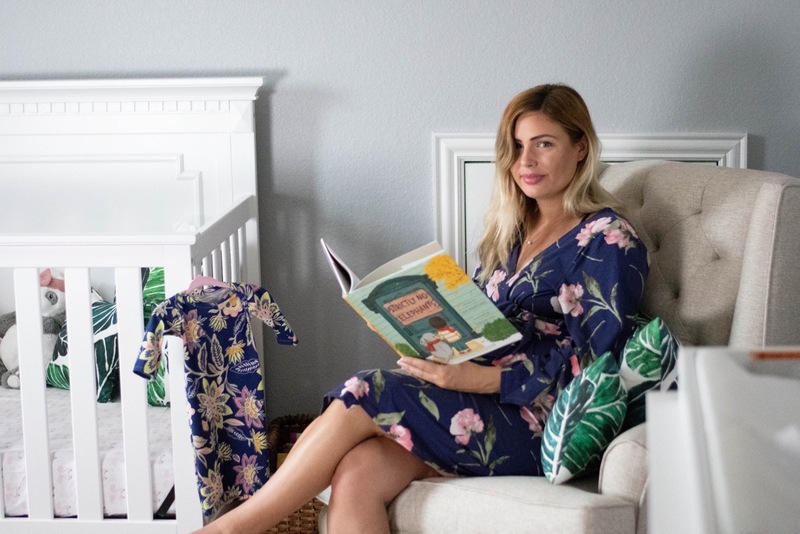 I don’t want to say I can’t wait to be able to use these together, because truth be told I’m happy to let her cook as long as she needs to – but I’ll be thrilled the day I get to dress her up in this cute sleeper! 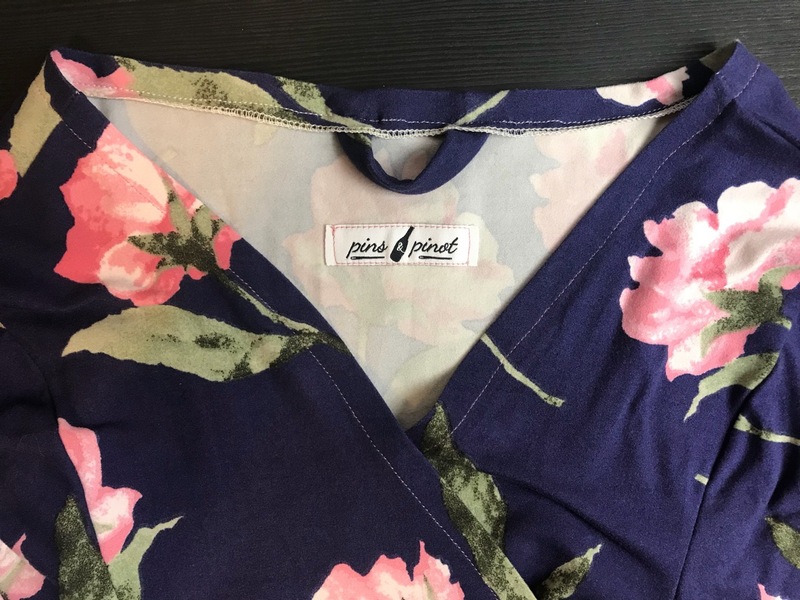 Though the robe fabric used in this post was generously provided to me by So Sew English Fabrics, all opinions expressed are my own, as always! So precious! I love the fabrics you used! Having a nice robe in the hospital was so helpful to feel somewhat put together after delivery.